After experiencing milling picture frames from 250 moldings in 11 different species of wood, we have some tips for what is usually a pretty time consuming process. 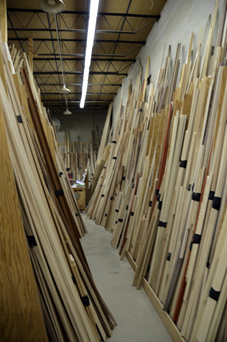 Each wood has it’s own characteristics that make milling a time consuming process. Customers often ask why it takes so long to get their frame? It’s a fair question, and I hope this blog helps customers gain some insight into what it takes to bring you your custom frames. We couldn’t possibly have 2,750 moldings milled on hand at all times, (and milled stock is also much more likely to warp). In order to keep offering the variety of options we provide for our customers, we mill your frame to your specifications as it is ordered. This is a very labor intensive process. We have a constant flow of wood delivered to us on a weekly basis. 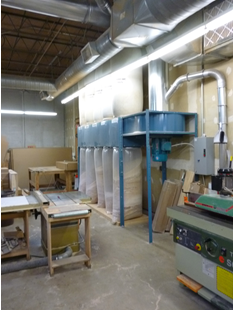 We go through this wood very quickly and therefore, create a lot of sawdust. The bags of sawdust, which stand 5 feet high, are stored in a container in our parking lot and when the container is full we call our friend Craig and he hauls it to Vermont to be used as bedding for cows. This takes us to the first step in the process of ASF creating custom frames to our customer’s specifications.